Joseph Soto Ortega is a chiropractic physician in Lakeland, Fla. where he addresses multiple and different physical conditions with a vast knowledge of the body interactions. At John O. Tucker, P.A. Office, I treat every patient as a unique individual with specific and personalized needs. I believe that every person has different necessary requirements to achieve that better state of health that is lost due to constant neglectful behaviors of our body functions. I believe that every person is one organism composed of different systems that interact between them for the common purpose of achieving balance. And functional disturbances of any kind in any of these systems can reflect in future problems that aggravate the overall health of the individual. As chiropractors, we are trained to specifically find the cause and/or causes of the condition and develop a plan to correct such deficiencies that compromise the patient health. It is not a matter of correcting or clearing any symptoms alone but a matter of correcting or helping the human body to reach that state of health that has been lost. We use different chiropractic techniques and different analytical methods to determine specific patient needs. We specialize in functional nutrition, functional neurology, craniopathy, sacro-occipital technique, massage therapy, functional rehabilitation assessment and others. We’d like to talk about a patient success story you’re especially proud of. A 55-year-old retired female presented to my office with a complaint of low back pain. She indicated that she had been a chiropractic patient for a long period of time and that she experienced periodic episodes of exacerbation of symptoms; but chiropractic care helped to diminished or resolve the issues for a fair period of time and she was willing to continue using chiropractic care for her problems. She also indicated that she experienced headaches and constant sinus problems for the past eight years. After a careful and complete physical exam using orthopedic, chiropractic, neurological and nutritional tools, it was determined that all her conditions were related. It is important to remember that if your condition extends to other organ systems and if we do not treat them in any form, the actual treatment plan will be incomplete and the issues will not be addressed appropriately and/or solved. In other words, we create a small band aid for a big injury and as a result we just cover the problem allowing it to grow deeper, stronger and more hazardous than before. In this case, treatment started immediately, consisting of periodic adjustment of the complete spine, skull, muscle imbalances, functional rehabilitation exercises and minuscule changes in daily activities that made a big difference in her state of health. In a matter of two and a half weeks the patient reported a significant reduction of low back pain, improved mobility and muscular strength. She was astonished of the fact that her sinuses were clear, she was able to breath better and she no longer experienced allergies or associated symptoms. My best advice to Chiro students is “Never stop learning.” You are in this profession not by chance, but by call and learning doesn’t stop with graduation – on the contrary it started in that moment. You are not doing this for yourself but for the people you are here to serve and for that same reason they deserve 110 percent of your attention and abilities. I have mentored tens of students and recent graduates in what it takes to be a successful clinical. Taking care of the patients is the No. 1 priority and everything else comes from that. I have taught many sacro-occipital seminars at the university and been an assistant instructor in numerous seminars around the country. Want to spend more time focusing on your patients and less time handling administrative work. 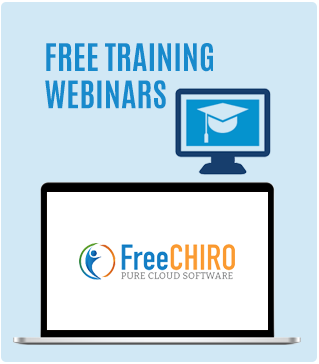 Find out how FreeCHIRO can help with your practice billing. Sign up for free!